Abergavenny Food Festival is an event I welcome warmly. The summer is always full of wonderful events, long evenings, sunshine, family and friends and fun days out. As soon as September begins, reality sets in that that's it for another year, and it's time to brace ourselves for the shorter days of Autumn and Winter. So unsurprisingly the event softens the blow a little, and offers a small extension of the buzz and festival feel of the summer. We woke up to blue skies and a fresh breeze on the Saturday morning, signs of a good day ahead. With the roof down we took the scenic route over to Wales, making the most of the unexpectedly glorious weather. I have never actually been to Abergavenny on a non-festival day so to me the town is always a hive of activity, bustling with people from all walks of life. I don't really want to imagine it any other way! This year we booked on to two masterclasses. The first was with Malaysian chef and Food Ambassador to Kuala Lumpur - Norman Musa. His Manchester restaurant 'Ning' is also a base for his cookery school. We were guided through a live demonstration of a few recipes from Norman's new cookbook 'Amazing Malaysia' followed by a sample of the food at the end. Dan and I both love the simplicity and freshness of Asian food, and the lightness of it compared to traditional British dishes. The combinations of spices and fresh ingredients always results in a deliciously clean bowl of food. The second masterclass was with Eleonora Galasso, who again led us through a few traditional Italian recipes from her new book 'As the Romans do'. A lot of Italian cooking seems to be based around using up ingredients and making sure leftovers never go to waste. Having spent some time in Milan a couple of years ago we learnt just how important food is to the Italians and how eating and meal times are an occasion rather than just a necessity. The process of cooking and eating becomes an enjoyable event rather than a chore and is always a social yet chilled affair. We try to sample and buy foods at the festival that we don't normally eat, or things that we wouldn't necessarily cook ourselves. Our first purchase this year was a bottle of Champonzu from The Wasabi Company, a sauce made from 5 Japanese citrus fruits and that can be used as a dressing, marinade or dipping sauce. The guys were so friendly and we learnt a lot about Wasabi! They grow and sell the plant here in the UK, a product that is so much more delicious than the Wasabi you buy in the supermarket. The taste is a lot cleaner, the texture much creamier. 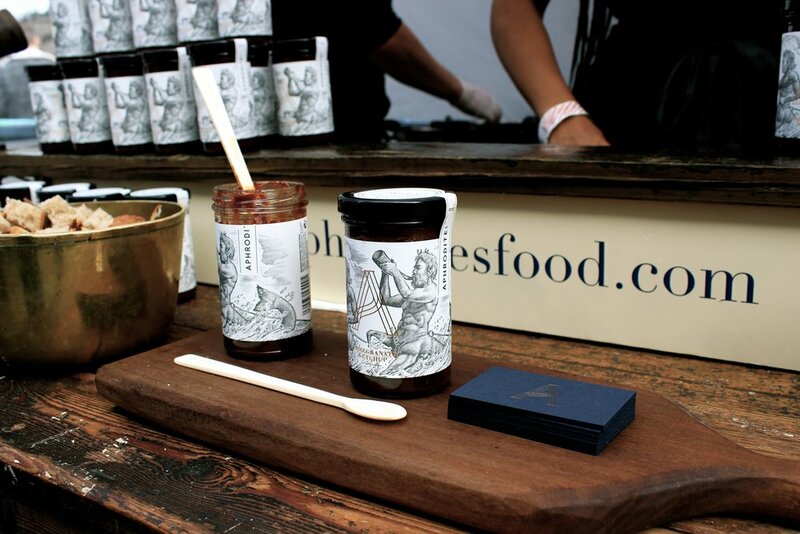 We also bought a jar of Eastern Meditteranean inspired Pomegranate Ketchup from Aphrodites, something I cannot wait to use! Again it can be used as a sauce or a marinade, and has a depth of taste so much richer than that of tomato ketchup. I also fell in love with the company's branding!! One of the things I love about Abergavenny is the vast range of unusual products and flavours. I am a bit of a fiend when it come to truffle, so just had to try the stilton and truffle honey macaroon from La Cave a Fromage - it was perhaps my favourite combination of flavours from the whole day! Absolutely delicious! 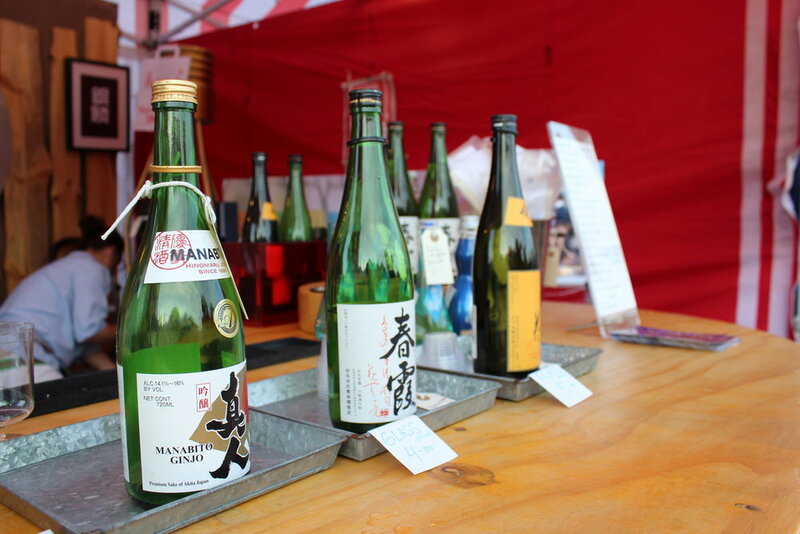 The food festival seemed the perfect opportunity to sample some Sake - the Japanese alcohol made from fermented rice. The lady on the stall was so welcoming and selected the 'perfect sake' for us after a few simple questions. It really was scrummy - so lightly refreshing and sweet! We will definitely be having a glass or two next time we go for sushi! My favourite part of the day is heading to the market hall where there is always an amazing aerial display. 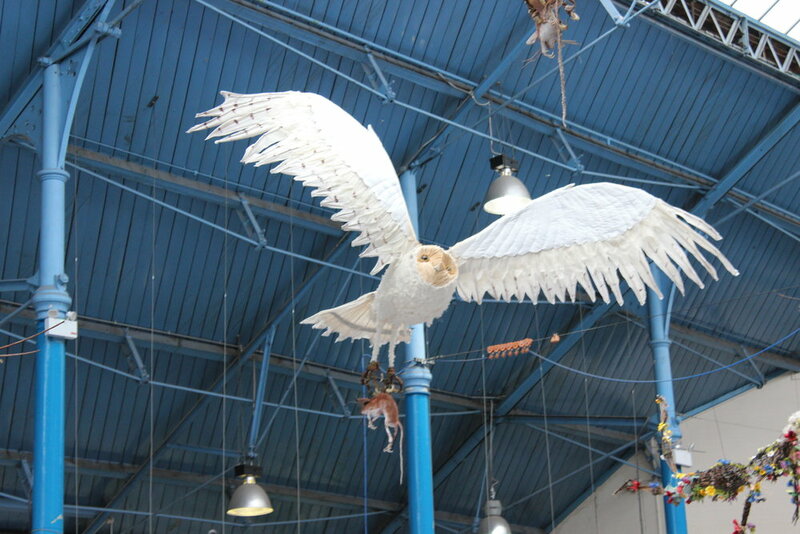 This year there were beautifully stitched human sized owls suspended from the ceiling. They were so incredibly life like, with some even clutching on to equally stunning mice, and others perched on branches or captured mid-flight. With full bellies (and a full rucksack!) we headed home with the sun setting on Abergavenny Food Festival for another year. I am already looking forward to the Christmas market in December..!